A complete solution provider in the field of surface preparation & paint spray booth provides its expertise for every industry. MGI design, manufactured, installed, erected & commissioned huge turnkey projects for various renowned giant industries. 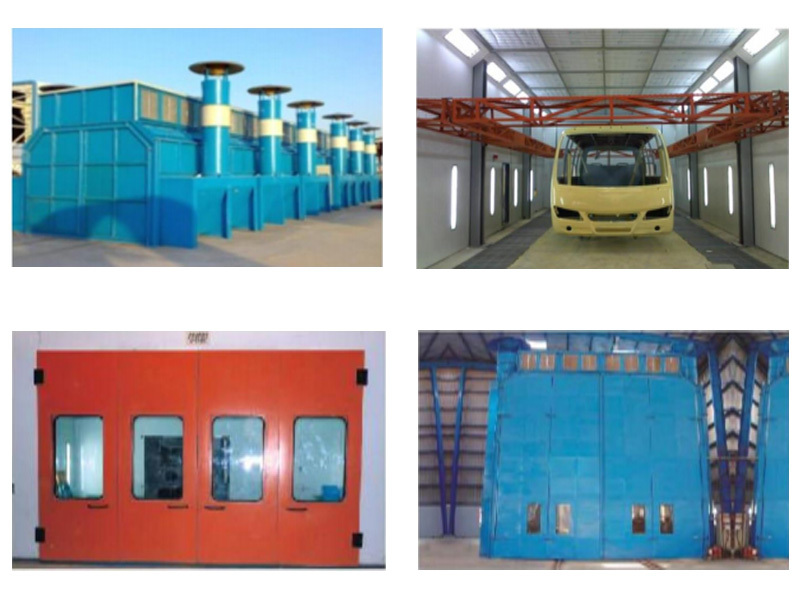 If you are looking for a Paint booth manufacturers in India then MGI can design and deliver paint booth across any state and city in India. You can find out the working process of paint booth in this insightful article. SAFETY – Spraying paint may involve fire risk from both solvent vapours and continuously over spray deposits. A risk eliminated by using a spray booth. Increase Productivity – Decrease operating cost due to elimination of water curtain chemical. The Vertical Down Draft (the direction of flow of air is towards the floor of spray booth) Paint Spray Booth is suitable for conventional, airless and electrostatic spray painting and its consists of painting chamber, Inlet Air Filter, Paint Trap Filters, axial flow Fan, electric motor, duct and canopy etc. The design of the paint booth will be of vertical down draft type paint booth with disposable paint trap filters on floor. The intake air into the paint booth is filtered by intake filter to avoid foreign particle deposition on the painted surface. The intake air is sucked into the room by the extraction modules located on the floor. Paint Spray booth is of rectangular shape rigid bolted construction. The structure is self supportingand will not need supporting foundation except fixing bolts. Fabricated out of 18swg M.S Sheet panels bolted with structural steel for rigidity. Maintain dust level to minimum, prevents spreading of paint and maintain clean air at the operators breathing level. 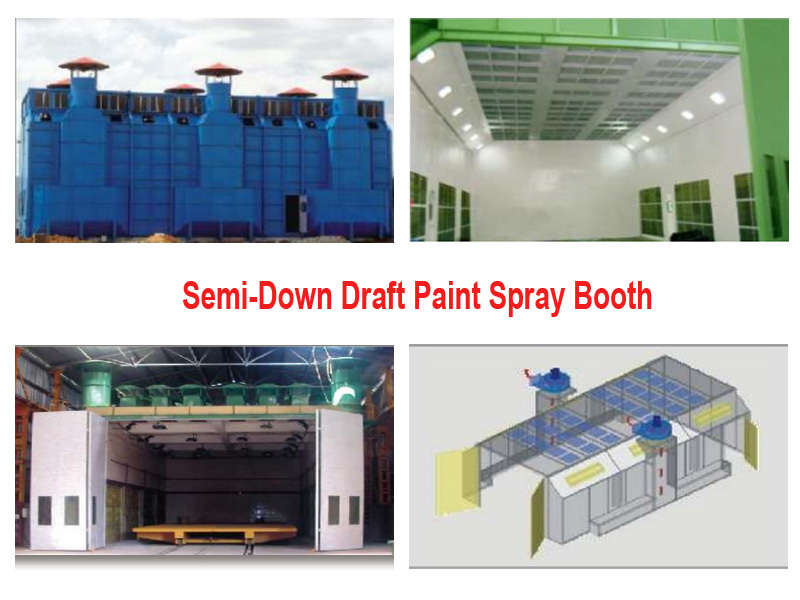 The Semi Down Draft (the direction of flow of air is towards the side walls of spray booth) Paint Spray Booth is suitable for conventional, air-less and electrostatic spray painting and its consists of painting chamber, Inlet Air Filter, Paint Trap Filters, axial flow Fan, electric motor, duct and canopy etc. The design of the paint booth will be of semi down draft type paint booth with disposable paint trap filters on side walls. The intake air into the paint booth is filtered by intake filter to avoid foreign particle deposition on the painted surface. The intake air is sucked into the room by the extraction modules located on the side walls. Spray booth is of rectangular shape rigid bolted construction. The structure is self-supporting and will not need supporting foundation except fixing bolts. Fabricated out of 18swg M.S Sheet panels bolted with structural steel for rigidity. 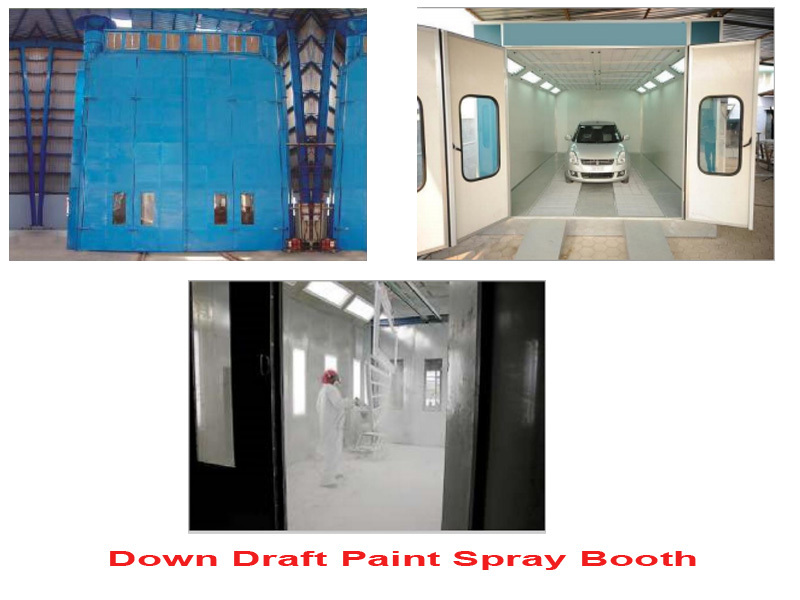 We manufacture high quality, long-lasting paint booth in India. 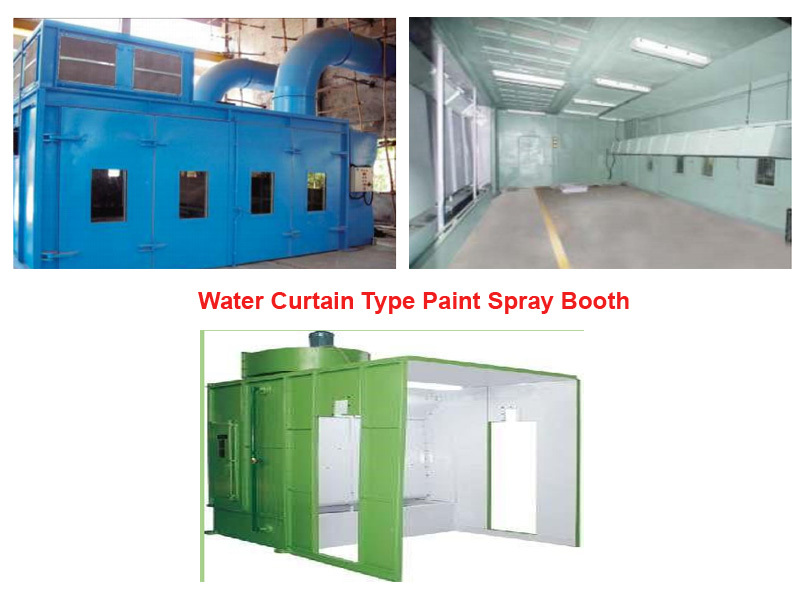 The End Draft (the direction of flow of air is towards the floor of spray booth) Paint Spray Booth is suitable for conventional, air-less and electrostatic spray painting and its consists of painting chamber, Inlet Air Filter, Paint Trap Filters, axial flow Fan, electric motor, duct and canopy etc. 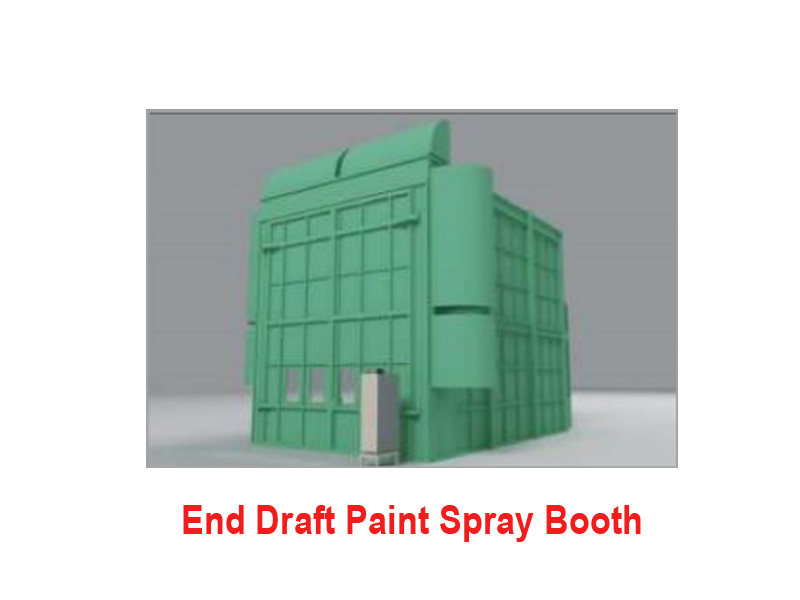 The design of the paint booth will be of End Draft type paint booth with disposable paint trap filters on floor. The intake air into the paint booth is filtered by intake filter to avoid foreign particle deposition on the painted surface. The intake air is sucked into the room by the extraction modules located on the back wall. The spray painting is carried out by operator with the help of spray painting gun [Buyer to arrange spray painting gun]. The paint fume particles are sucked by the partial vacuum created by exhaust fan through a water curtain. The air is cleaned by scrubbing action in turbulent water. The particulate matter remains floating on water tank is periodically removed manually. The air discharged into the atmosphere is clean and thus keeps the environment clean and friendly. Spray booth is of rectangular shape rigid bolted construction. The structure is self-supporting and will not need supporting foundation except fixing bolts. Fabricated out of 18swg M.S Sheet panels bolted with structural steel for rigidity. The practical expertise enables us to design the Water Curtain Spray Booth with superior performance. The spray booth is modular in construction so that booth can be easily installed, modified or integrated into complete plant. The additional middle suction, clearly provides improved air guidance and better suction of hazardous paint fume particles. The water film thickness on the drain wall can be adjusted individually via throttle valves. Moreover, the unit meets OSHA’s safety requirements. The spray painting is carried out by operator with the help of spray-painting gun [Buyer to arrange spray painting gun]. The paint fume particles are sucked by the partial vacuum created by exhaust fan through a tank of water. The particulate matter floating on water tank is periodically removed manually. The air discharged into the atmosphere is clean and thus keeps the environment clean and friendly. Wet fume collector is fabricated from 2mm steel sheet and suitably reinforced for strength and rigidity. Grating will be provided on water tank in paint spray booth. Water tank is civil constructed as per pit drg. provided by us. However, detailed civil drg. for pit construction is in buyer’s scope. Baffle type arrangement to eliminate the moisture from air exit out in atmosphere. During operation, a series of eliminator separate the air from the liquid moisture. Clean air is exhausted to atmosphere. Side doors of size 500 mm (W) x 100 mm (H) is provided at the sides of wet fume collector for inspection and maintenance. Disposal of paint particulate matter from the water tank is manual. During Thermal Spray process dust is generated to keep the environment friendly suction is created by an exhaust. Fan causes the dust laden air to enter a winder area after an abrupt change in its direction. At this stage heavier dust particles settle down without causing any abrasion to the metallic surfaces, which can be removed through a clean out door. After this the air carrying finer dust particles strikes the water surface and travels beneath plate of a venture system creating a stream of droplets entraining dust. This stream undergoes a further change in direction causing dust to get collected in the water. Dust free but wet air strikes a number of baffles where the moisture is separated and clean air escapes to the atmosphere through the exhaust fan. The collected dust settles down as sludge at the bottom of the wet collector and is cleaned out manually at intervals through a drain. Call Us for a Complete Solution for Painting & Baking and for all kinds of Paint Booth Manufacturing in India.